Luna’s TrueClot® hemorrhage control training products provide unprecedented and low-cost realism for all levels of bleeding control training. TrueClot® products have been or can be used in active shooter scenarios, basic and advanced Emergency Medical Technician (EMT) and paramedic courses, Bleeding Control (B-Con), Tactical Combat Casualty Care (TCCC and C4), Tactical Medicine (TACMED), Tactical Emergency Casualty Care (TECC), Law Enforcement and First Response Tactical Casualty Care (LEFR-TCC), Self Aid/Buddy Aid (SABA), Prehospital Trauma Life Support (PHTLS) and other standardized or customized training courses. 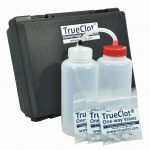 TrueClot® provides enhanced hands-on skill station resources, including simple, cost-effective, easy-to-use, affordable and durable wound packing task trainers, the most realistic dynamically clotting blood simulant available and realistic mock-ups of commercially available hemostatic gauze.